Kendall Alginate Hydrocolloid Dressings by Cardinal Health, formerly Covidien/Medronic, wick up fluids for light to moderate exudating wounds such as pressure ulcers, donor sites and burns. As an alginate dressing it helps to speed up the healing process as the gel fibers soak up excess fluid while maintaining a moist wound environment. Alginate is very absorbent and therefore requires fewer dressing changes which also means the wound isn't disturbed as much. The perimeter has a thin profile to conform to the skin and stay in place for optimal protection in keeping out bacteria. 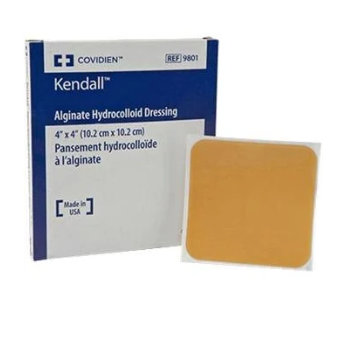 Choose from a variety of sizes of Kendall Alginate Hydrocolloid Dressing to best suit the wound. The 6 x 7 inch dressing is designed specifically to treat dermal or pressure ulcers located at the sacrum. Each dressing is packaged sterile to not introduce bacteria to the wound. Before applying the dressing, properly prep the wound by flushing it with gentle Saline Wound Wash.